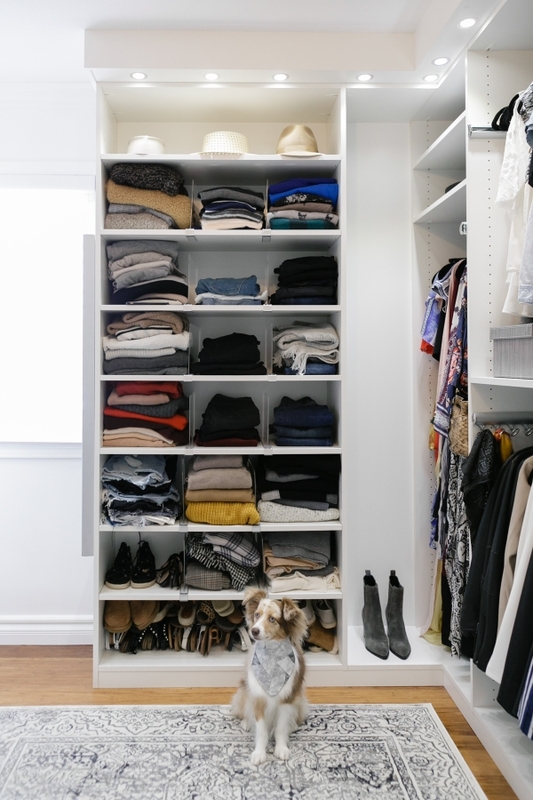 I could not be more excited to be sharing my finished closet with you all today!! It’s been a labor of love and I have been literally BURSTING to share it. 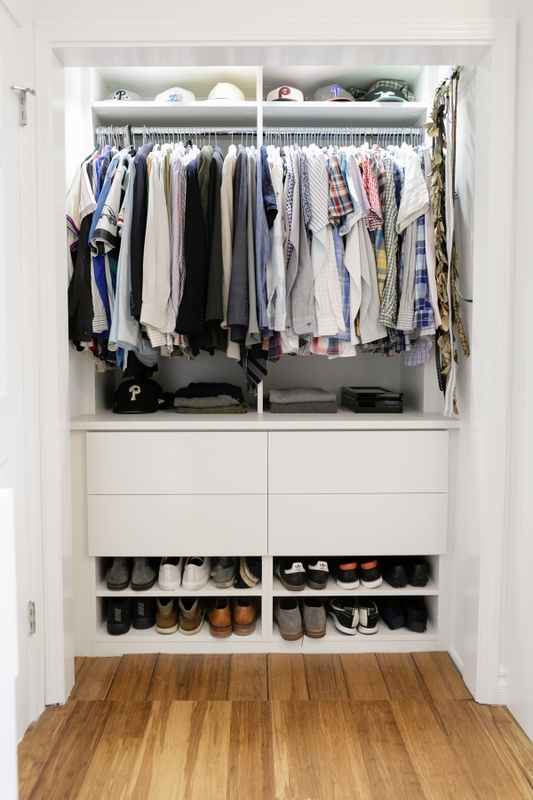 As I mentioned here, I was looking to create a clean, crisp and modern closet space. 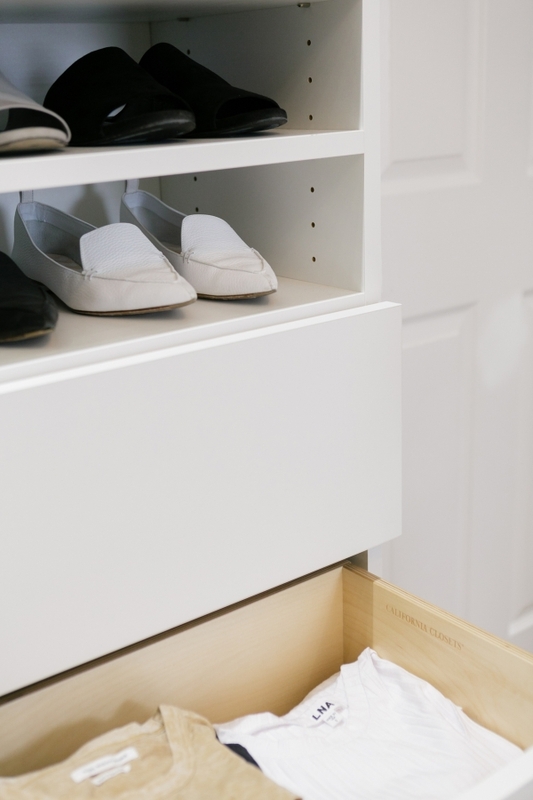 For the space, I wanted to get the most out of every square inch of that room which is why I chose to work with California Closets to totally transform one of the bedrooms in our home into a walk in closet. I started the project meeting my designer, Heather, at the Corona Del Mar showroom location. Heather is originally from the east coast as well so the minute I met her, we vibed. She just GOT me. I shared my closet inspirations with her and she came up with 2 beautiful concepts for our closet design. 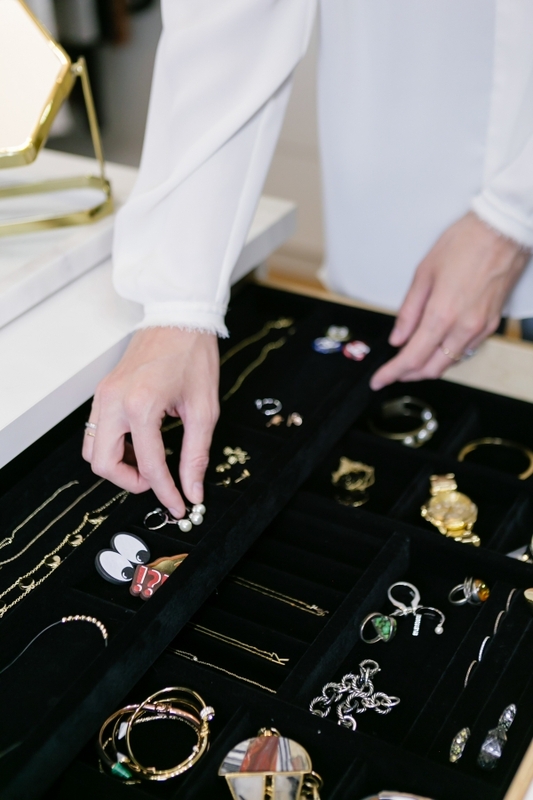 It was helpful to go into the showroom to see how some of the pieces functioned, and to see the finishes first hand. I love being able to touch and feel the materials to envision how the space would be finished. 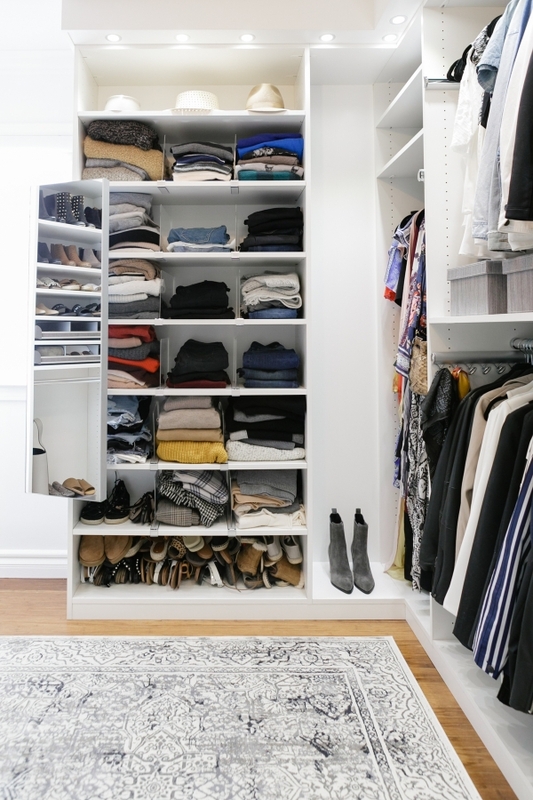 In the end, I was able to create my dream closet and I still get giddy when I walk into the room. 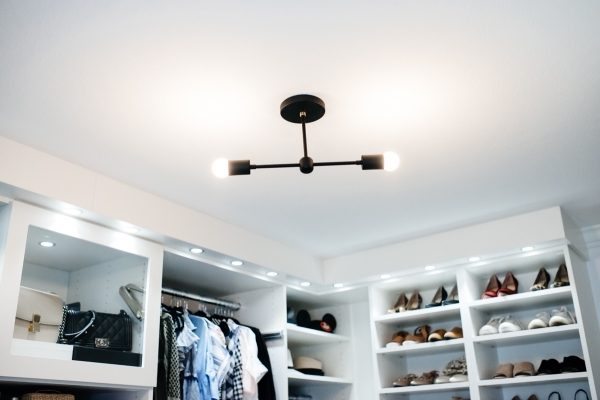 For the lighting in the room, we utilized LED lighting that was actually built into the closet to be able to really see everything on display. What’s the point of having this great space if you can’t really see the clothing. The room initially had an outdated ceiling fan and I knew I wanted to replace it with a statement lighting fixture. I turned to my friends at ParkStudio, a local LA based lighting company, that helped to create a custom sized fixture to fit into my space. 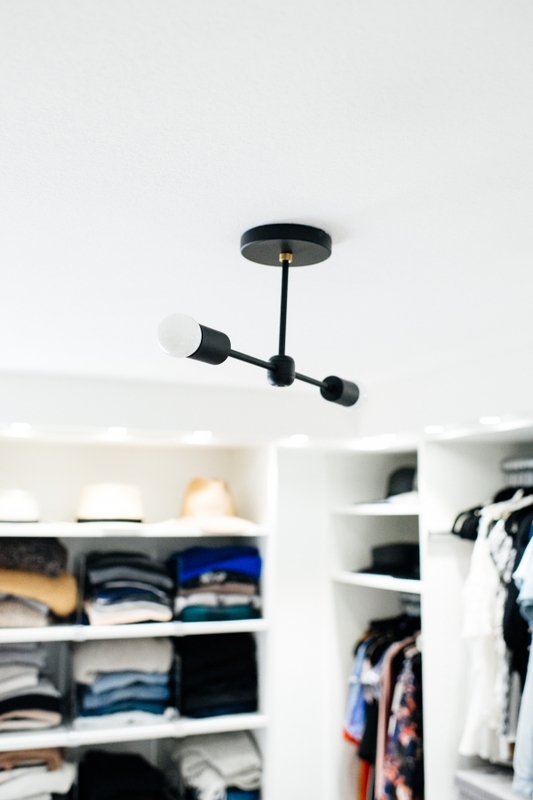 We customized the drop and length of the Granger fixture to fit the space and allow for the swinging glass door to open. I wanted to keep the color palette of the closet all black and white. So the black lighting fixture added a bold contrast to the space. For the rug, I picked a subtle pattern from Loloi to add a bit of texture to the space. A couple odds and ends finished the space which I linked to below. 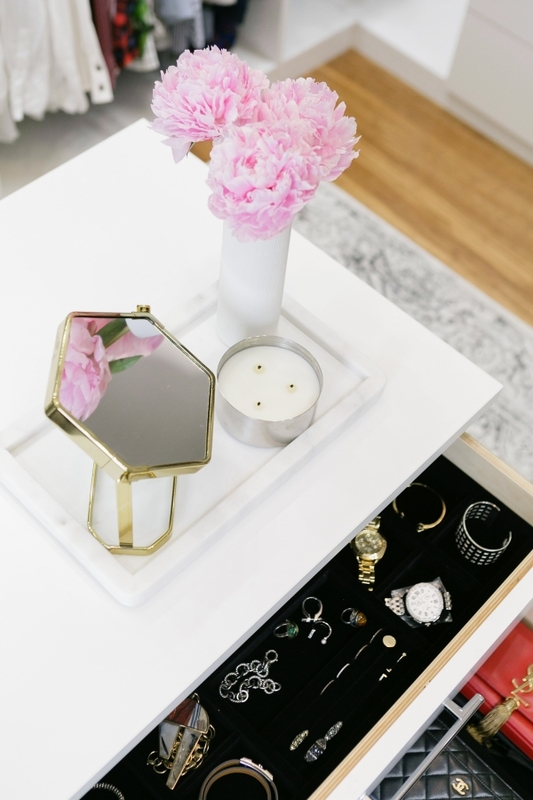 One of my favorite things about the closet is the custom island that is actually on wheels! It’s great to be able to move it around when shooting photos for the blog and moving it out of the way when I want to pack my suitcase. 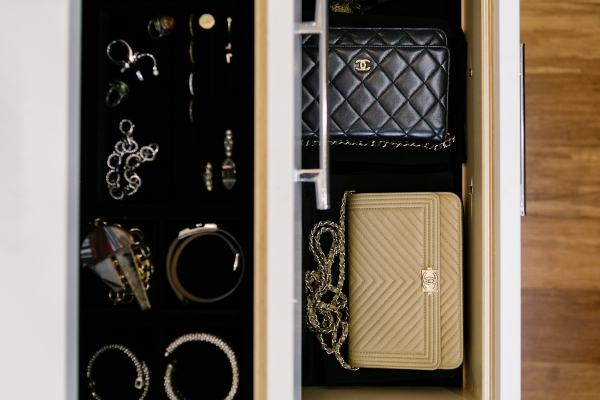 It houses my jewelry and all my precious mini bags. The other thing I love is that Blake’s portion of the closet is actually taking up the space of the original closet in the room. The original closet of the bedroom was actually very deep and tall. We were able to get the most out of this space for him by adding drawers and shelving in addition to his hanging space. 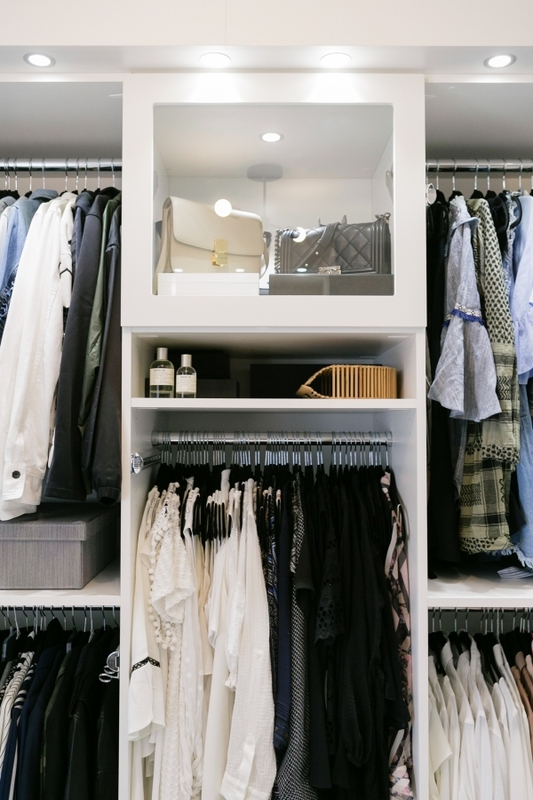 Blake’s section of the closet might be small, but it’s mighty! Thankfully I have a husband that let’s me take over the whole closet. THANK YOU BLAKE! 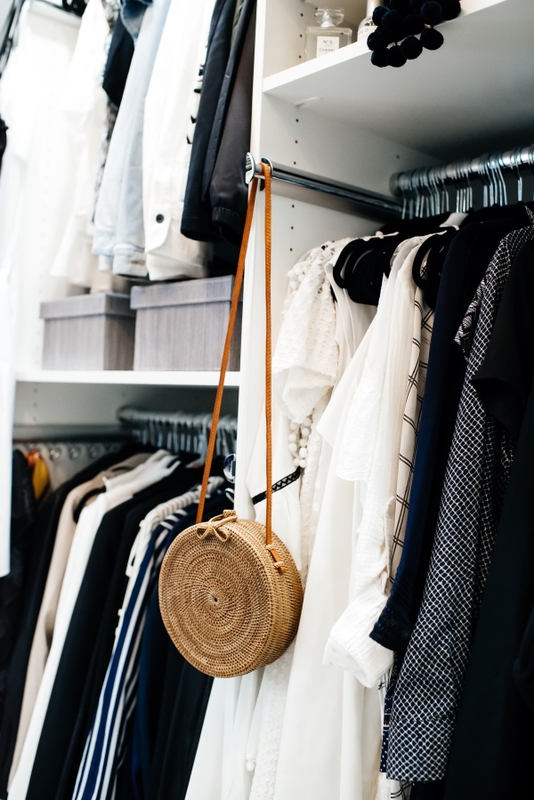 If you want to read more about the space, MyDomaine featuring my closet and I answered tons of questions from design, editing your closet, and more tips on how to create your perfect dream closet. You can read the article here. Now that the closet is done, next on the agenda is to transform our bedroom. Stay tuned! Charmaine Ng | Architecture & Lifestyle Blog - Oh. My. God. 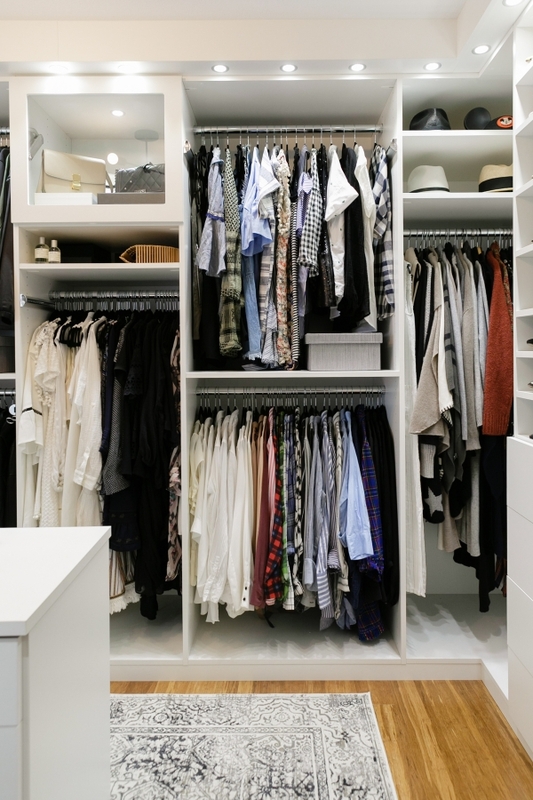 You have my dream closet. If only I had that much space in my room! Natali - Oh my! That is def. 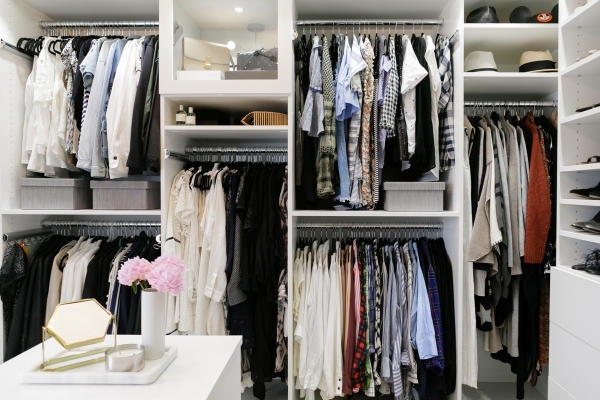 a dreamy closet! Sharon - Wow!!! You guys did a great job, you must be so happy. If I were you I’d be walking in there and constantly admiring the results of your hard work. 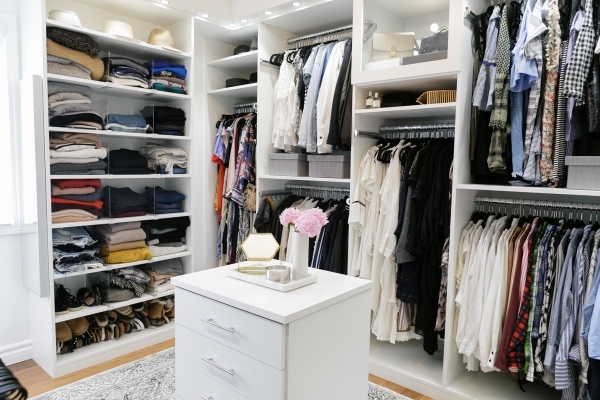 Esther - Your closet is really stunning. Amanda - This came out SO good! Love all the clean lines and how everything has it’s own spot. So so good. Margarita - Love, love, love it. It’s so perfect!